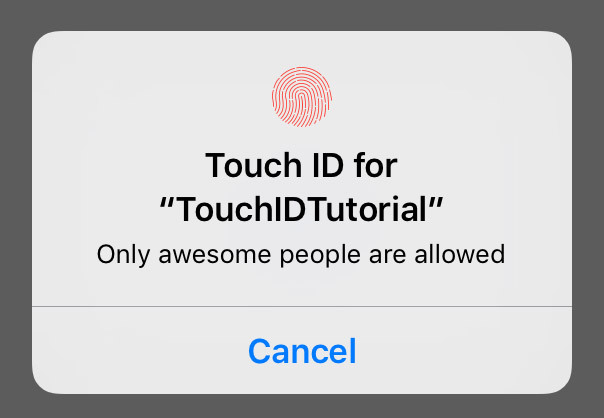 If you want to work with TouchID, you’ll have to link your app with the Local Authentication framework. Go to Project Settings > General and scroll down to the Linked Frameworks and Libraries section. Click on the + sign and add LocalAuthentication.framework. For this example we’ll just show the user a screen with a login button. If the user touched the login button, he will be asked to authenticate via TouchID. If the authentication fails, we’ll show an error message. If it succeeds we’ll push a new view controller onto the navigation stack. I’ve added an IBAction in my AuthenticationViewController, and hooked it up to the UIButton. First you’ll need to import the Local Authentication framework at the top of the AuthenticationViewController. The Local Authentication framework is quite small for Apple standards. It only has one class named LAContext. First we need to create an authentication context. You do this by creating an instance of the LAContext class. Because not every device has a TouchID sensor, we need to ask the context if there is a fingerprint sensor. You do this by calling the method canEvaluatePolicy:error. This method will return a boolean which you can use to provide a fallback authentication method if there is no TouchID available. // If not, show the user an alert view and bail out! I use the guard statement here introduced in Swift 2, because this method needs to return true, otherwise there is no point of executing the rest of the method. For now, I’ll just present the user with an UIAlertViewController to give some feedback. If the device does have a TouchID sensor, we want to present the user the typical TouchID form. This popup is shown when you call the evaluatePolicy:localizedReason:reply: method on your authentication context. The method navigateToAuthenticatedViewController just gets a view controller in my Storyboard and performs a pushViewController on the navigation controller. If there is an error, I have a method which returns an error message based on the error code. The error codes can be compared to the LAError class. message = "Authentication was cancelled by application"
message = "The user failed to provide valid credentials"
message = "The context is invalid"
message = "Passcode is not set on the device"
message = "Authentication was cancelled by the system"
message = "Too many failed attempts." message = "TouchID is not available on the device"
message = "The user did cancel"
message = "The user chose to use the fallback"
message = "Did not find error code on LAError object"